My Asian friend, Trader Ming, has brought us yet another jewel from the Orient. These aren't terribly dissimilar from the Chicken Cilantro Mini Wontons. 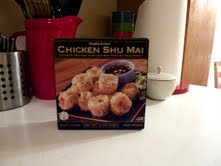 However, here are a few ways they do differ: Trader Joe brought us the Wontons...Trader Ming brought us the Shu Mai, The Wontons have more cilantro than the Shu Mai, and the Wontons are sort of dumpling-shaped little thingies...and the Shu Mai is round-ish. Sonia says these are way better pan-fried than steamed in the microwave. Makes sense. We both liked them. Sonia gives them a 4 and I give them 4 and a half. Bottom line: 8.5 out of 10.